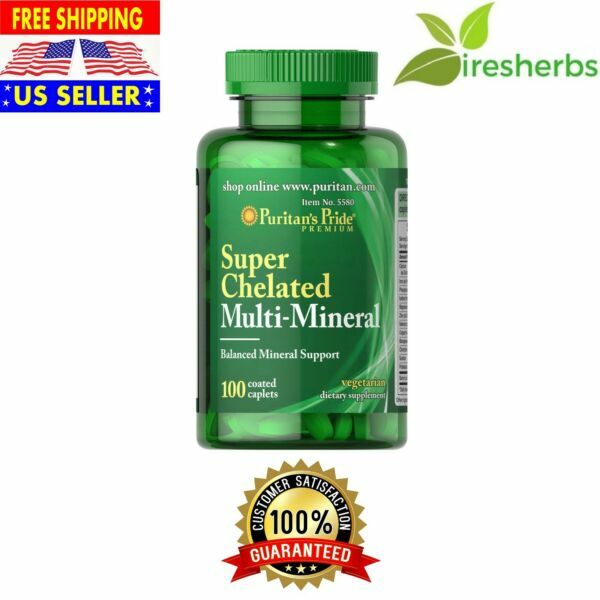 You are bidding on (1) Brand New & Factory Sealed Bottle of CHELATED MULTI MINERAL - DIETARY SUPPLEMENT - 100 COATED CAPLETS. Serving Size 2 TabletsServings Per Container 50Amount Per Serving% Daily ValueCalcium500 mg 50% (as Dicalcium Phosphate and Calcium Carbonate)Iron10 mg 56% (as Ferrous Gluconate)Phosphorus200 mg 20% (as Dicalcium Phosphate)Iodine150 mcg 100% (from Kelp)Magnesium250 mg 63% (as Magnesium Oxide)Zinc10 mg 67% (as Zinc Gluconate)Selenium26 mcg 37% (as Selenium Yeast)Copper0.25 mg 13% (as Copper Gluconate)Manganese10 mg 500% (as Manganese Gluconate)Chromium20 mcg 17% (as Chromium Amino Acid Chelate)Sodium10 mg 1%Potassium66 mg 2% (as Potassium Citrate)Boron2 mg ** (as Boron Citrate and Boron Aspartate)*Percent Daily Values are based on a 2,000 calorie diet. **Daily Value not established. WARNING: If you are pregnant, nursing, taking any medications or have any medical or thyroid condition, consult your doctor before use. Avoid this product if you are allergic to yeast. Discontinue use and consult your doctor if any adverse reactions occur. Store at room temperature. Do not use if seal under cap is broken or missing.